Three weeks from now I will be back on the road. On this next trip I’m heading home… as in, I’m heading to the mountains, the place where my soul resides even when my body is inside bricks and mortar in a city. I’ve been blessed, even spoiled, to see and hike through so many of the world’s great mountain regions, and as my next mountain journey – to South Africa’s Drakensbergs – approaches, it’s set me wondering. Of all the treks and mountains, which few have crystallised in my mind as the finest of all? Over the last couple of weeks, I’ve been thinking about past wanders, juggling mountains and footsteps in my head to find the 10 treks that stand out as the most memorable of my mountain experiences on foot. I’ve subsequently tried to rank the treks, which is a little like trying to choose your favourite child. Over coming weeks I’ll walk you through this list of 10. For me, it’ll be as much an excuse to relive fine and inspiring times in the mountains as an attempt to highlight some of the most beautiful places on the planet. My selections should all be read with the knowledge that they’re entirely subjective and limited. There are vast tracts of the planet, and entire mountain ranges, I’ve not seen or walked. I’ve hiked very little in North America, and I haven’t walked to any great extent in the northern reaches of the Andes. The likes of the Karakoram, the Pamirs, Reunion and the GR20 remain ambitions rather than experiences. The trail through the Khumbu to Everest Base Camp has become such a honeypot for trekkers that it’s often been called the Everest Highway. 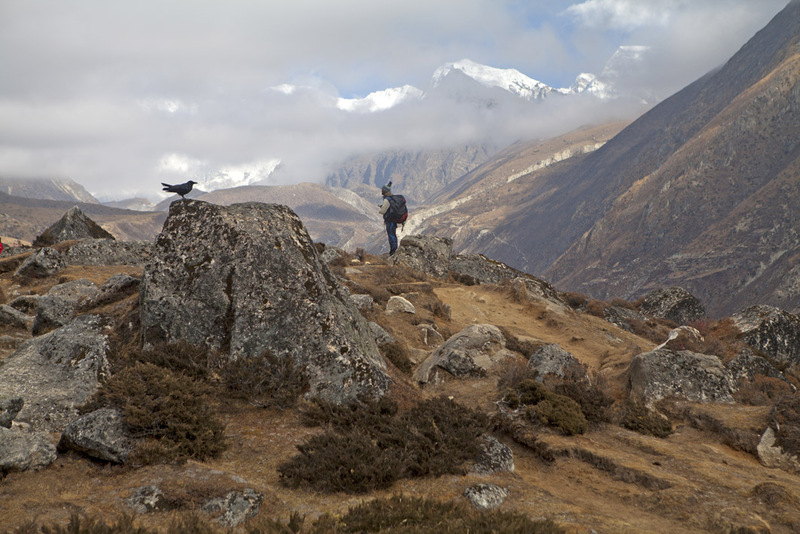 But a few hours’ walk beyond Namche Bazaar, a side trail turns away, following the Dudh Kosi river up to the Gokyo Lakes, the world’s highest freshwater lake system. It’s not itself an uncrowded trail, but it’s all relative by now – after the pedestrian traffic jams between Lukla and Namche, it feels almost like isolation. I walked here near the start of winter, and at night our tents and sleeping bags would freeze, while in the day my beard would occasionally freeze. In return, waterfalls hung suspended, frozen in motion, and shadows sharpened the lines of the mountains. 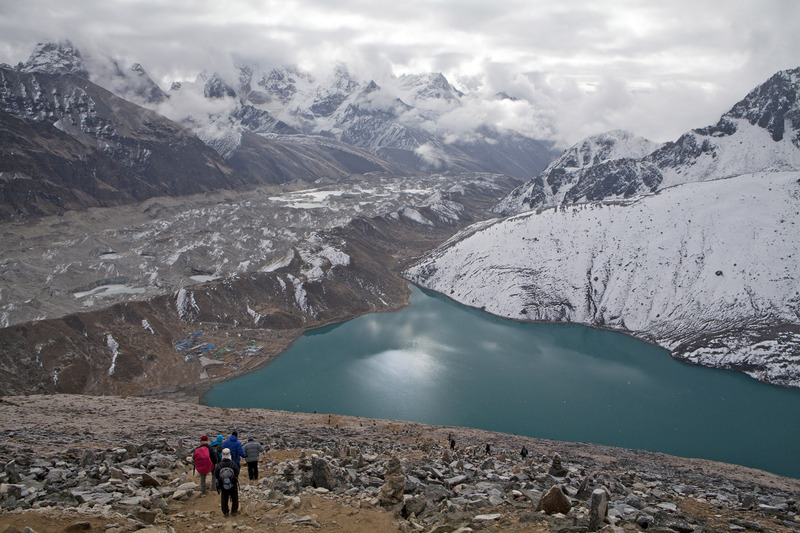 The goal of this trek is the black peak of Gokyo Ri, rising above the ramshackle village of Gokyo. One hiking guidebook asserts that the 5360-metre mountain has a “strong claim to be the best accessible viewpoint in Nepal”. From its summit you look down onto the longest glacier in the Himalayas, and out across four of the world’s six highest peaks, including Mt Everest…or so they say. As we climbed through the dawn from Gokyo, skating across the frozen inlet of the lake, cloud smothered the mountain tops. There’s be no view this morning. On the summit, in a hollow of prayer flags, we huddled about in ice-cold mist. It should have been disappointing – I’d walked for a week just to see big mountains disappearing into cloud – but there’s something indefinably complete about standing on a Himalayan peak, even a relatively simple one such as Gokyo Ri. Something that surpasses views. I was standing at the heart of what Bill Tilman once called “the grandest 30 miles of the Himalaya”, and I can still think of few more perfect places in which to see little. Adventure before Avarice hiked to Gokyo Ri with World Expeditions. * For news on all things adventure, including expedition news from across the world, visit Adventure before Avarice’s Facebook page. Thank you for recalling Gokyo Ri as one of the “few more perfect places in which to see little.” When I stood there back in Oct ’05 my first thought was “that’s it?” But then it melted into the exuberance of “I’m here!” And that’s the real part of the journey! That’s a great way to describe it Dorie – melting into the exuberance of I’m here. I think the experience of such places is more about us than the place.